Not really true in my situation. I am on a grandfathered iphone unlimited plan. A new unlimited plan costs what I am paying now. Not really a fair comparison though, since this was always the case. The old unlimited plans were available for such a short time (discontinued literally one month after the launch of the first iPad), that you could really only have gotten one subsidized phone. If you've upgraded your device in the past 7 years, it's been at full price with no service discount. No, grandfathered renewals were allowed. I'm on my 4th subsidized phone under the original iphone plan. I went from 3gs -> 4s-> 5s -> 6s on the same plan. The original plan for iphone was around for almost 4 years. I'd take that bet in a heartbeat as well. Alfaspider is insane if he thinks the primary purchasers of this new phone are going to be the wealthy. I must have spoken to a dozen people yesterday who were itching to reserve one, not a single one of these people even makes $50k and several of them make less than half that (they are all on my staff). Apple hasn't sold a billion phones marketing to the wealthy. The single greatest example of the power of branding that this world has ever seen. As far as it being "worth" $1k, from the perspective that people are generally using them several hours a day; there is no way to disagree with that statement. But, that is what is most scary. An observation: Many young people can't afford cars and houses like we did at their age (I'm 57)...so they splurge on phones and Starbucks. I'm one of the people in that category. Early 30s, only making $60k. And that's exactly why I don't spend money on "stuff [that I] can afford, such as nice smart phones, eating out, fashion, vacations, etc." I have three financial goals. In order: 1) Retire at 50; 2) Paid off mortgage at 50; 3) Own a DeLorean. So I invest 20% of gross income in order to reach number one. After that, excess money gets thrown at the principal of the mortgage, which I put 30% down so my PITI would only be $800/month (at least $200/month needs to be spent paying down principal), because that's goal 2. Maybe someday I'll get to save for the DeLorean. But because I'm so far from goal 1 and goal 2, I don't have money to spend on "stuff [that I] can afford." Yeah, those things are good. But the worst enemy of "great" is "good." You have to set goals and not let "good" things come along and derail them. To me, that $1,000 phone does exactly the same thing that my free, five-year-old LG MyTouch Q does - make phone calls and send texts. Except that $1,000 phone does it worse because it doesn't have a physical keyboard to text on. Believe it or not. On ATT I tried to buy my phone outright. If I made that choice I would lose out on a $20/month service credit. Forced me in to a Next agreement. I guess they try to use that as a 2 year lockin. I'm not sure what that would have been about. We receive a $20/month service credit for each line on ATT listed as 'Discount for Access' but as far as I am aware this is a result of our phones being out of contract. Buying the phone outright or paying monthly should have no impact on the price you pay for service. The carriers use this method as a de-facto way of keeping you in contract because most people won't or can't pony up the cash to pay off their phones to 'release' them from their 'contracts'. Here are the new prices of all iPhones. What I don't know is whether the Apple Stores will continue offering their recycling buyback discounts when you bring in your old iPhone. I've been holding off on replacing my much-dinged Galaxy S5, and was waiting to see if the new iPhone was worth it. I'm inclined to try an iPhone this time, as it would fit in with the general all-mac ecosystem at home. My primary needs from a phone are security and performance/responsiveness. I don't spend a ton of time on social media, so emoji's aren't exactly a selling point. I don't need a blackphone level security, but I'm also not too fond of carrier delays in OS updates either, or manufacturer provided junkware. Amount is not the issue. I want a phone that I can use for atleast the next 3-4 years and does what I need without too much fuss. I'm still undecided if that's the iPhone, or if there is a better android option. I could use some help deciding. By discount do you mean the gift card they give you for your trade in? There's not a discount on top of that is there? Anyone have any negative experience with buying a refurb directly from Apple? You get the same 1 year warranty as a new phone but save around $100 off the new price. I have. My last two Iphones were refurbs and will never settle for one again. My first refurb purchase was an IPhone 4 which kept freezing just past 12 months; had to continually turn off/on to get it going. My young daughter dropped the phone and fell in our pool, so I replaced it with a refurbished IPhone 6 and what do you know, it freezes as well, though not as common. My wife still has an IPhone 5 that she purchased new and it still works as it should. I have yet to decided on the 8 or a 7, but for sure I will never buy a refurbished phone again. The only bad part is it is so identifiable everyone will know you have a $1,000 phone. 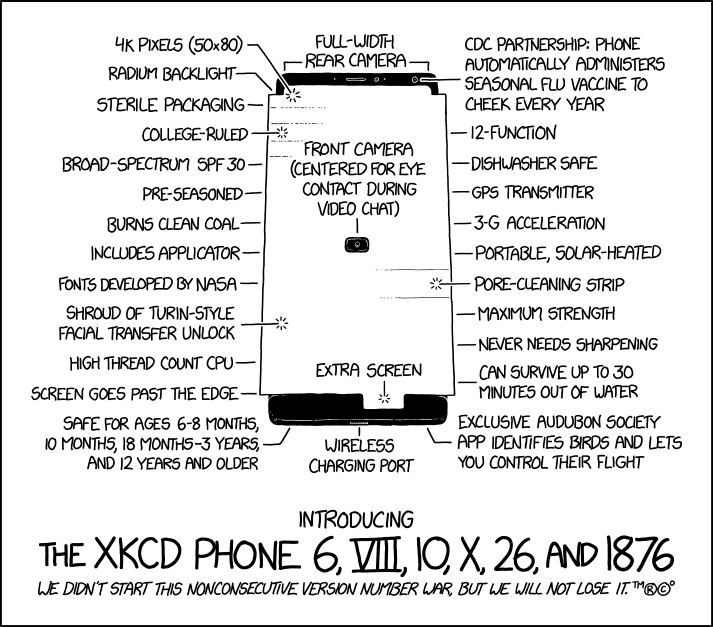 So I will probably opt for the 8 Plus <sigh>. isn't the 8 Plus like $940...not a huge difference. In my experience, Apple refurbs are among the best there are. I've purchased a couple (mostly back in the old iPod days), and gotten a couple as replacements for broken devices. The only perceptible difference is the refurbs come in an unattractive brown box. That's it. Every single returned device gets disassembled and tested, and the case and battery are replaced. They would never get caught if they sold these devices as new, in standard retail packaging. My refurb iPad Air (replacement for new unit that I broke the screen on), which is nearly 4 years old at this point, still works flawlessly after 4+ hrs/day of heavy use. I gave it to my wife after I upgraded to the 10.5" Pro, and expect it will last her several more years easily. My refurb iPod Nano (purchased) worked fine for many years until Apple recalled them due to a battery defect affecting the entire 1st generation. I seriously doubt saving 20% as opposed to 15% of your income at $50k/yr will significantly change your quality of retirement life. At most, it will allow you a few extra expenditures down the road when you're well past the age of prime health and possibly too old to enjoy many of the things you would have enjoyed when you were healthy and younger. Add in company match, possible income appreciation and the monthly contribution appreciation that would result in if one stuck with the 15% or 20% savings rate, and of course the results would be higher. It still has the home button so it isn't as easily identifiable. Good for you! You are not the typical consumer, you are smart you are a BH. Yep, and all of that $350k difference will be consumed with 1.5 years of nursing home care, which you would likely qualify for anyway via government assistance if you were already flat out broke. And that's after 35 years of REALLY being frugal to save your income at $50k/year - it is REALLY hard to squeeze out an extra 5%/month of savings at 50k/yr. Throw in a kid, and fuggetabout it. I see. I miss understood what you meant by your post. My bad. These diverse range of individual valuations will make the price tolerance fall all over the map. My POV? What a ridiculous rip-off! But that's my self-entitled opinion...and you can easily guess at the value dimension(s) I'm operating within. The tortoise wins every time I read that story. Both phones restored from the same backup by any chance? The one parent that we had who needed full time care and passed away earlier this year, the cost was $5500 per month. So it certainly was not a $350K cost for 1 1/2 years. It would have taken over 5 years to blow through $350K. It all depends on the cost of living of where you live, how your budget is structured, and what your discipline is. A young Millennial with no student loans, no car loans, and making $50K who has kept their budget within the confines of 50/20/30 and is receiving a company match in the 401K is doing just fine. According to the U.S. Bureau of the Census, slightly over 5 percent of the 65+ population occupy nursing homes, congregate care, assisted living, and board-and-care homes, and about 4.2 percent are in nursing homes at any given time. I'd take those odds. 3 out of our 4 parents avoided it and passed without any LTC, nursing care, assisted living, board-and-care homes, etc... . There is nothing wrong with a $50K salary. It's very common to have a dual income household where if both members of the couple are making $50K, then it's a horse of a different color financially speaking. 50/20/30 - no matter what your income level. Save the equivalent of an hour's wage per day, every day of your working career. The path to accumulating wealth has many entrance ramps. Last edited by CyclingDuo on Wed Sep 13, 2017 9:05 pm, edited 1 time in total. RIDICULOUS !! Over priced, over-hyped, etc. Is this a cult or what? Keep your present phone if it meets your needs and I am sure it does for most of us. Take the money you would be spending -- at purchase and each month thereafter and buy the fabled 3 Index Funds. You'll be happier down the road and a lot richer. I'll likely get it. But here's my rationale: my son's new wife just damaged her iPhone 6. So I'll buy the iPhone X for me, give my iPhone 7 to my wife, she gives her iPhone 6S to our new daughter-in-law, and I take the damaged iPhone 6 and sell it on eBay. All that, plus it's got better cameras, 2 hrs longer battery life and Qi charging (which works in my car) compared with my current 7. I had originally planned on retiring Jul 5th, but my boss asked me to stay on and finish up a few things (likely done mid-Oct), so I now have some unplanned fun money for just this sort of thing. You mean the ones that cost $699 back in 2014 and 2015? They are now paid for and we managed to handle that "over priced, over-hyped cult like phone purchase" without any issues in terms of saving money and following our budgets. Suddenly, 2-3 years later and if we qualify for an upgrade or want an upgrade, you don't think we will be able to handle the iPhone 8 or X's cost? What if we are already doing that, but still have plenty of discretionary income left to take a stab at the new iPhones? So in your world, R&D is free? I'm not advocating the $1000 price tag, but 20% margin is just not realistic. That's why Apple stock is doing well. Personally, I would pay $300 max for it if I need a new phone. Manufacturing cost of a new iPhone is roughly $225-$250. I'd give Apple 20% margin. But that's it. Now Apple price it at $1000, I'll let someone else buy it. Yes it should be marginal with the economic of scale. I googled how many iPhones have been sold. As of 7/27/16, cumulative iphone sales has reached 1 billion. My generous 20% margin would give Apple $50 billion profit. That'd cover R&D, ehh? That means I'm not buying any iPhone soon. I'll probably get a used iPhone 5 years down the road. I use my iPhone so much each day, primarily in my business, if I could get it today I would gladly pay the $1,000. My loaded Iphone 7+ was nearly $1k direct from Apple. My 128GB unlocked 6s with AppleCare+ was $1,000 in Dec 2015. I would buy the X for the bigger screen (and enable screen zoom) if I didn't have a bunch of new home costs. I use my phone constantly, and the camera would be another key reason. I can wait until my current phone is at least 3 years old. At 4 years, Apple is going to start making your phone obsolete. 2 year contract works out to be about $1.37 per day for this Apple X phone. Water bill, on average, is about $1.39 per day for me. Cup of black coffee at the local coffee shop is $1.50 per day for me. Internet bill, on average, is about $1.65 per day for me. Cable TV bill, on average, is about $3.28 per day for me. One adult beverage cocktail, on average, at home is about $3.50 per day for me. Home electric bill, on average, is about $3.62 per day for me.. Commute per day, on average, is about $3.89 in gas alone per day for me. I guess the new iPhone X will be one of my cheapest costs if/when I upgrade. Why don't you pay more for Internet? I mean $3.30 a day would still be worth it, right? Why don't you just send them twice as much money for the same product, since it's still "a good deal per day" for you. You have no problem sending Apple twice as much per day as you need to for the same benefits. Maybe you should double pay all your utilities and your barber too. Or maybe you should wonder why you're not willing to pay $80 for a $40 meal, but you are willing to pay $1000 for a $500 phone. But you already have an iPhone that you use "so much each day". Why do you need a new one? I find the tone of some comments about new iPhones, Teslas very interesting from a BH perspective. I worked very hard, lived frugally and saved/invested for over 30-years so my family and I would have enough funds to experience some pleasures if I lived long enough. So, for the record, I own a Tesla Model S. I am going to buy a Tesla Model 3. I am going to buy an iPhone X (256 GB). I fly business class on most international flights. I take up to ten family members on vacation. I donate to charity. IMO, harvesting the fruits of our labor and prudent living is enjoyable and rewarding. You're old now with a ton of money because you didn't waste money on Teslas and business class flights when you were young. Are you advising young people to buy Teslas and $1000 phones, and fly business class? No, but clearly advising people who can afford it and want to do it not to feel bad about it. My kids told me the news at dinner time tonight. "Hey dad, Apple just came out with the iPhone X!" => "Really, how is it better than the Note8?" "It's new - it's bigger and better!" => "Did you know the Samsung has a much brighter screen?" => "Did you know the Samsung comes with twice as much memory?" => "And did you know the iphone doesn't even come with a headphone jack?" "You mean I'd have to get some kind of adapter cable?" I'm still using my Samsung Galaxy S3. Perhaps in about 5 more years I'll consider a new phone. I have an S5 that is already starting to feel slow, you must be more patient than me. Sorry I don't understand that statement at all. I think he makes a good point. I have been using my iPhone 6 for some time and have become frustrated with it. If I upgrade (not sure that I will), I would gladly upgrade and pay that per day cost for a better screen, faster processor, and more features. Maybe I missed some argument earlier in the thread but I would gladly pay the $1.37 per day over two years. Personally, I like to find offsets for things like iPhones so might give up the coffee for the phone for awhile. Maybe switch to bringing kerig cups to work. Why don't you pay more for Internet? Because we only have one service provider where I live. Should I move to see if I could find one that costs more? I mean $3.30 a day would still be worth it, right? Homer - If it came with a massage, sure. But I'd have to give up my cup of coffee at work to cover the cost. Why don't you just send them twice as much money for the same product, since it's still "a good deal per day" for you. Homer - that sounds like a reasonable, well thought out response from one who also has a lifetime of experience of placing things in perspective with their hard earned money. You have no problem sending Apple twice as much per day as you need to for the same benefits. Been using Apple since 1985. Sounds like you are simply joyous that as consumers, my family is part of their "ecosystem". We did have a long list of LG, Nokia, and Samsung phones before our carrier finally added iPhones to our options. I've only been using cell phones since 1995, so give me another couple of decades to figure out what works best and gives the "experience" that earns a share of my paycheck. Maybe you should double pay all your utilities and your barber too. How insulting! I don't go to a "barber". Please. I do water my grass more this year during the drought to keep the sections of the yard that had some sod work done during our landscaping this Summer alive. Gotcha covered Homer on that higher utilities suggestion due to that. Or maybe you should wonder why you're not willing to pay $80 for a $40 meal, but you are willing to pay $1000 for a $500 phone. Hint: the $40 meal is really a $20 meal if we cook it ourselves at home. Stay in the game here, Homer. I don't have a $1000 phone. I have an iPhone 6. The iPhone 8's and X's cannot be ordered until September 15th, and will not be available until September 22nd. You have to watch the video to see what Mr. Cook said as it contained those pertinent dates. Thanks for playing, though, Homer. Glad you enjoyed the list of daily cost hypotheticals and placing things in perspective. We only get to do this journey one time. What you choose to bring on the journey with you is a HUGE part of the travel plan. The cool thing is - our budget is balanced no matter what brand of phone is attached to my bike's handlebars. I'll likely get it. But here's my rationale: my son's new wife just damaged her iPhone 6. So I'll buy the iPhone X for me, give my iPhone 7 to my wife, she gives her iPhone 6S to our new daughter-in-law, and I take the damaged iPhone 6 and sell it on eBay. Assuming by "damaged" you mean "cracked the screen", why not just get the phone replaced for $129? Even if you wind up selling it, you should get more for a refurb in perfect condition than an old device that's all dinged up. Sure the phones are expensive but phone plans are so cheap now It's a net savings still. I was taking a look through my records and I was paying AT&T just over $100/mo with taxes back in 2010 plus $200 or so upfront for the phone every 2 years. You can get unlimited talk/text/6gb LTE data/unlimited throttled for $40 a month with taxes from AT&T. Over two years thats $1440 in savings! Enough for an iPhone X, extra charger, case, etc. etc. And the phone is still probably worth $400 on eBay after 2 years. This product category has come down in price overall. Yes, that's the question to answer, even for a Tesla owner. My iPhone 6 is sometimes sluggish and awkward, the battery doesn't seem to last as long, and I've beat up the screen protector pretty badly (hopefully not the glass underneath). But, right now I plug my headphones in before getting on the elliptical; I guess I'd have to get new headphones or adjust to ear buds. The camera's okay, and I recently switched back to my dSLR tethered to my iPhone/iPad. Forgetting the money, in my book it's a wash. If someone could convince me that the phone calling (remember that?) is better, I'd buy one. Better reception in so-so areas, better audio quality, I'm in. Otherwise, I'll wait till my 6 dies. Btw, I'd also love it if I could turn off Autocorrect in the calendar app. I have an appointment for "Fishing" tomorrow, and I can't figure out which friend, doctor, service was autocorrected to "Fishing," but I guarantee I didn't schedule Fishing for tomorrow, unless it was at Whole Foods. Someone will be stood up tomorrow, unless they were coming to my house. Had the issue with my S5 a few weeks ago that it started to crash at 15% power. Wife's began to as well (it's eerie to me how our phones always have the same issues at the same time, even though I am much more of a power user than she is). We replaced them in the last few weeks with IPhones, an SE and a 6, because they were on super markdown sale from Straight Talk. Paid 330$ combined. Samsungs we've owned have been nice. These are nice. I'll probably buy whichever feature phone is marked down on Straight Talk when it is time to buy the next one. xkcd is on the job. ...and then Buffy staked Edward. The end. I am not sure if new Iphones support new T-Mobile 600 MHz frequency. T-Mobile users may need to wait for another phone. Yep - that is where this started: with the screen being cracked. However, while troubleshooting this, she found out that the low/distorted speaker volume was due to some water penetration too (device still "works", but is really sub-optimal). Plus, her's is the crazy low-storage 8GB device (wife's hand-me-down is 64GB). All that said, I'm sure *somebody* on e-Bay will buy it and find a good use for it. Did the iPhone ever get the capability (either natively or through an app) to set do not disturb times for notifications, but still allow calls to come through? That's what moved me to Android in the first place. On Android it's easy to adjust a few settings and have a device that makes no noises whatsoever on your bedside table unless you get an actual call. Very useful for on call docs, IT folks, etc. i am an android user, but am happy to see Apple come up with newer and better things because it only forces the android makers to cram better tech into their phones but they have to undercut apple pricing. so in the long run i get more for less. We've had iphones for a while, but we've always had older versions. The difference between them is negligible, IMO. We have the 6 and it is working fine. Maybe in a year or two, we'll buy another 6 or SE if we need a new phone. Fair enough. There was no excuse for Apple to even be selling an 8GB model 3 years ago. No it was an online transaction. Clicked buy outright and line discount disappeared. Reclicked next payment plan and the credit came back on. Frankly due to TVM it's better I pay over time on a no interest plan than to pay cash upfront anyway. They might not make a 6 in a year or two but more likely you'll be left behind from an OS version standpoint and 1 by 1 your apps will eventually stop working. They don't make the 6 NOW. It was discontinued on September 7, 2016, the day the 7 was introduced. 6s (and the SE, which is based on the 6s hardware) will probably go away next year. This is what ticks me off. Spend $700 on a new phone and then a few years later they make it obsolete with updates even though the hardware is still working fine. My wife just ordered a refurb 6S 128G for $469. Maybe she's better off just buying a new 8 64G for $699 and not having to worry about it being obsolete for awhile. I don't really agree with that. Although smartphones are a maturing product, if we consider the iPhone as the first "modern" smartphone, they are only 10 years old. It took over 30 years of PC development for you not to want to replace your home computer every 3 or 4 years due to obsolescence--i.e. a circa 2012 computer works just fine now (I still use my 2012 laptop), but the computer I got for my freshman year of college in 2004 definitely needed an upgrade by my senior year starting in 2007. Of course my 2004 laptop still works now if all I want to do is type an email or write in word/excel, but it certainly isn't a good experience. Your no longer supported iPhone will continue to "work" until it no longer supports any available network, but it will eventually not be a good experience.